Remember when this winter wasn’t supposed to be like last winter? It seems, with the snow we’ve been getting, we were fooled. Since our local bow-tie-wearing weatherman has revised his snow total expectancy for the winter of 2011, I’ve been working hard to make sure we have plenty of “fuel” in the fridge and cabinets since, at this rate, you never know what to expect. Since it’s difficult to stock the fridge with food that will stay fresh until the next snowpocalypse, I focus on maintaining the stock of dried, canned, and even frozen goods. At this point, there are an infinite number of dishes that would result from a varying combination of canned or frozen vegetables, pasta, rice, beans, and other goodies, all hearty enough to make you forget about shoveling your car out. This one, for sure, is warm, filling and just a tad spicy; the perfect mixture of each to help you brave the cold. Add extra-virgin olive oil to medium pot, and heat on medium. 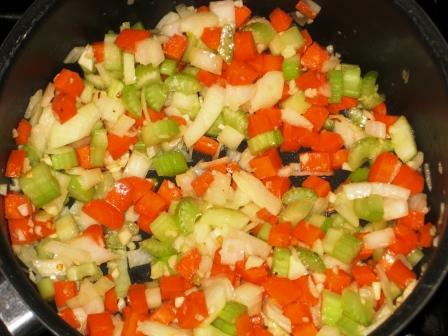 Add garlic and crushed red pepper flakes, stir then stir in the onions, carrots, and celery. 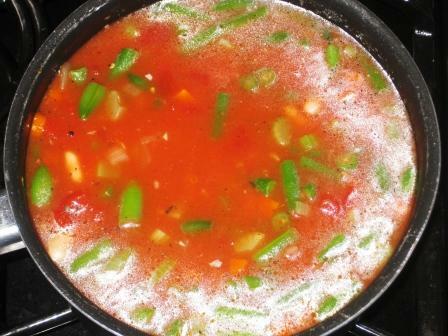 Cook 10 minutes, then add in the stock, tomatoes and beans. Bring soup up to a bubble and season with salt and pepper, to your taste. Simmer 5 minutes. Turn off the heat and add dried basil into the soup. First and foremost: any recipe created by anyone’s Mom is going to be good. There was no doubt in my mind the end result of this “stoup” (soup/stew, coined by Rachael Ray herself) would be “yum-o”. Cooking down the carrot, celery and onion develops a strong flavor base for the stoup to build on. The very little amount of red pepper flakes is incredibly noticeable, yet wouldn’t qualify the dish as spicy. 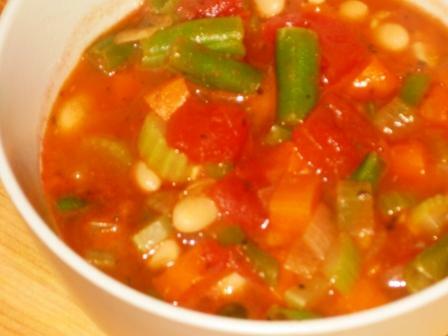 The varieties of beans add a stew like substance to the recipe, but initially I was tentative that frozen green beans would add an unnecessary amount of water to the dish. In the end, they didn’t water it down and they maintained a texture that could fool anyone into thinking they were fresh. Though the original recipe calls for the addition of fresh basil at the very end, I’m incapable of keeping the fresh basil fresh. The dried alternative served just fine, and this is the type of recipe you could dress up with other dried herbs if you please. Not only is Rachael Ray’s family recipe easy to make, it’s easy to eat. Filling and warm, tomato and white bean stoup is perfect for a snowy day, a lazy Sunday afternoon, a Friday night with friends, or even a regular Wednesday night.